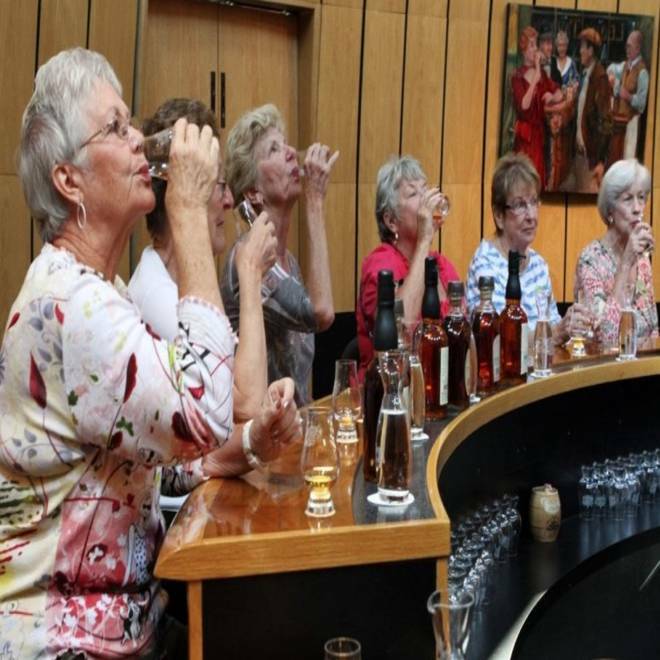 To wisely enjoy the Kentucky Bourbon Trail, sign up for a bus tour, such as one run by Mint Julep Tours. Hopworks Urban Brewery, a former fuel depot that’s been converted into the world’s first eco-brewpub. All of the beers are organic, the brew kettle and delivery truck run on biodiesel made from cooking oil in the kitchen, and even kegs find new life as planters in front of the brewery. Cascade Brewing Company Barrel House, which specializes in sour-style beers. Lively Run Goat Dairy, one of the first commercial goat dairy operations in the state. Cortijo El Tobazo, where the Soler Romero family has grown olives since 1850. La Cazuela Andaluza, a small family-run restaurant right off the trail near where the Olive Oil Greenway meets the Ruta de Califato (the path that connects Cordóba to Granada). Bourbon was born in Kentucky, so you might as well go to the source for a tasting. The self-guided trail, designed by the Kentucky Distillers Association, takes visitors to six distilleries (in between Louisville and Lexington), which are easily split into two loops. In terms of transportation, a better-safe-than-sorry option is Mint Julep Tours, which operates bus tours from place to place. The Orielle de Cochon, a beignet-like pastry stuffed with boudin, at Café Des Amis in Breaux Bridge. All sorts of Tabasco flavors at the McIlhenny family’s Avery Island, where the peppers for the hot sauce are still grown. Buckhorn Tavern. Its burger beat out Bobby Flay’s on a "Throwdown" episode in 2009. Blake’s Lotaburger, a statewide chain and one of the many diners that claims to have invented the green-chile cheeseburger. As the story goes, customers would order a cheeseburger and bring their own chiles to put on top; eventually, Blake caught on and started serving the burgers that way. The Owl Bar & Café, located in the tiny town of San Antonio. The green chile here is sandwiched between the meat patty and the melted cheese. San Miniato, a small Italian town responsible for a quarter of the country’s white truffle crop, plays host to dozens of truffle-related activities every fall, including festivals and fairs, demonstrations and special restaurant menus celebrating the fungus. If you're visiting during another time, get your truffle fix at the Ristorante Canapone in Piazza Bonaparte, which has plenty of truffle dishes on the menu year-round. Surfing Goat Dairy, Hawaii's only award-winning caprine operation. German expats own the 42-acre working goat dairy farm, which produces more than 25 cheeses. Tedeschi vineyards, on the historic grounds of Rose Ranch, where King Kalakaua once came to relax. Alii Kula Lavender Farm, home to some 55,000 lavender plants and 45 different varieties of lavender, olive trees, hydrangea, and protea blooming on 10.5 acres. The Haliimaile General Store from Beverly Gannon, one of the original chefs behind the Hawaii Regional Cuisine movement. GoFish on Granville Island for local spot prawns and fish tacos. The restaurant is located at Fisherman’s Wharf, where you’ll see fishermen selling the shrimp right off their boats. C restaurant, the first eatery in the Vancouver Aquarium’s Ocean Wise conservation program, which partners with local restaurants to help them provide sustainable seafood. Tojo’s Seafood, where the California roll was supposedly invented. Kirin, for Chinese takes on jellyfish, clams and sea urchin, many of them caught locally.